Mirabai (also known as Meera) was born in 1504 A.D. at Chaukari village in Merta District of Rajasthan. As a young child Mirabai would spend her time playing with a small image of Krishna. Nobody understood her infatuation. But to Mirabai this doll was a living embodiment of Krishna. From an early age Mirabai dedicated her life to the worship and praise of her beloved Krishna. However, depsite her life of intense devotion, she faced great difficulties from her family who didn’t respect the amount of time she would spend in devotion to Krishna. At the time Meera was born there was widespread political and social turmoil in India. Bloody conflicts for petty selfish gains, disrespect for human life and hatred for others was a norm. Meera was bewildered and at a loss to understand all that was going on all around. She was in search of peace which she found in Chaitanya’s Vaishnav Panth and dedicated her life to the love of Lord Krishna. Mirabai began to devote most of her time in prayer and worship and did not pay any attention to the etiquettes of a royal household. This led her to be subjected to great hardships and punishments. 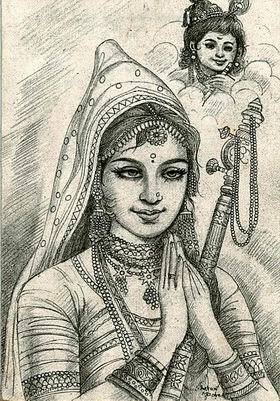 These physical hardships became intolerable and after praying to Krishna, she left the palace for good and went to the pilgrimage of Mathura, Vrindavana and finally to Dwarika. Mirabai was a born poetess. She expressed in a beautiful style her intense and deep love of God. She composed hundreds of poems in a simple, unpretentious style. They are full of vivacity and feelings. No poetess in the history of India enjoys a greater respect than Meera. Her poems have gained a unique popularity and are sung by the rich and the poor alike, even to this day. She spent her life dancing In trance and singing the attributes of her Beloved Krishna. Mirabai left this mortal world in 1550 to be united with her beloved Krishna. She was a great Hindu woman saint and will always be remembered.